Your safari experience involves many exciting hours viewing wildlife – and we want you to enjoy every second of it! 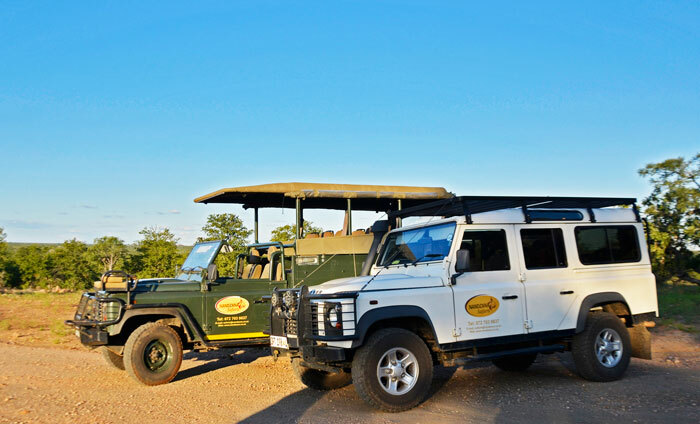 As such, we ensure that each of the vehicles is stocked for maximum flexibility, comfort, and wildlife viewing. The vehicles are equipped with a cooler box of ice for cool drinks and bottled water, as well as a tea, coffee and rusks box. We also carry an “on-board library” consisting of relevant field guide books and a Kruger Park map, etc. We also carry binoculars for guests to use. And a light but warm fleecy blanket for chilly early mornings or evenings. 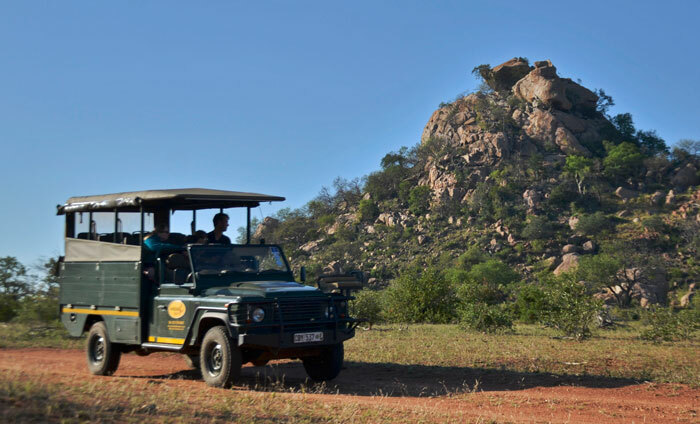 Your private safari includes exclusive use of the vehicle with no mileage restrictions and unlimited game drives within the Kruger Park for the duration of your safari. Your open safari vehicle is specially designed for optimum game viewing. Its high ride height is fantastic for game viewing (many sightings will be missed when travelling in a standard height vehicle). It is designed with tiered seating so nobody’s view is blocked by the person’s head in front of them! It has roll-down canvas canopies that can be closed if the weather becomes un-cooperative. It is fully air-conditioned. . . with fresh bushveld air! It is also a great option for families with young kids. It’s ideal if you have kids under the age of 6 as they are not permitted on open vehicles in the park. It can also be fitted with a car seat for a baby. Maximum: 3 adults and 2 kids or 2 adults and 3 kids. The Land Rover is the iconic safari vehicle for good reason. Land Rovers have been exploring Africa for 68 years and conquered some of the world’s most inhospitable territory… giving it true legendary status. It is exactly what you want when exploring the remote areas of Africa - practical and reliable, yet comfortable and of extraordinary capability. They are designed for minimum impact on rough terrain, are very reliable in extreme conditions and have the uncanny ability to go practically anywhere. Besides, the Land Rover, being the icon of African exploration, is definitely going to be one of the stars on your photos when you are back home and showing your images to friends and family!